Welsh writing in English has a long tradition of writing ‘place’. The recent spatial turn in literary criticism has led to a productive exchange of ideas with new geography, cultural history and digital technologies. The complex ways in which literature engages with place have begun to challenge and expand methodologies in other fields at the same time as they have presented literary scholars with dynamic new avenues of critical enquiry. Innovative approaches exploring the intersections between literary texts and cartographic representations of place are being enabled by digital Geographical Information Systems (GIS). Alongside such scholarly developments, there has been a clearly identifiable resurgence in new writing from Wales that addresses the topographical, geo-political, personal and historical dimensions of our ongoing relationship with place and space. This conference will explore the multiple dimensions of literary engagements with space, place, cartography and topography. There will be a prominent creative-critical strand and we encourage proposals from creative practitioners willing to reflect on their own work and/or that of other authors. 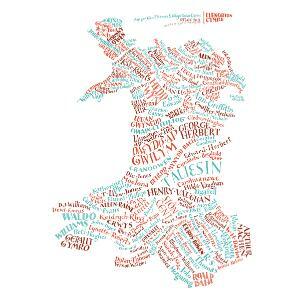 Literary Map of Wales, by kind permission of the Literary Gift Company. The conference is organised by Kirsti Bohata (K.Bohata@swansea.ac.uk) and Matthew Jarvis (m.jarvis@tsd.ac.uk). ‎There has been great interest in this event and the organsiers wish to thank all those who have sent in proposals for papers and posters. We are grateful too for generous financial support from Aberystwyth University and CREW, Swansea University and to the Literary Gift Company (www.theliterarygiftcompany.com) for permission to use images of their Literary Map of Wales. Dr Aidan Byrne (The Plashing Vole) wrote a review of the conference on his blog and published a large set of conference photos on flickr.